17 Emergency Storm Kit MUST HAVES! You are here: Home / Family Living / Household Hacks / 17 Emergency Storm Kit MUST HAVES! This past winter our electricity was out for a few days during an ice storm and we were COMPLETELY unprepared! 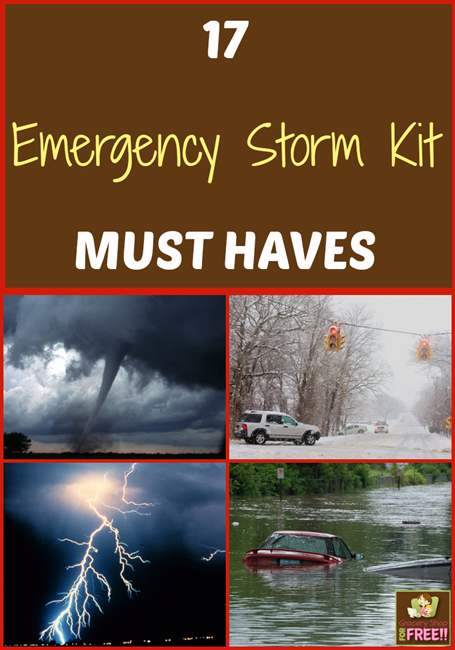 So, I want to share with you 17 Emergency Storm Kit MUST HAVES, so you will be prepared for any type of storm. Now, granted we lived in Texas and it’s not 20 below but, it was FREEZING! We couldn’t get warm, we couldn’t cook, charge our phones, nothing. It was miserable! So, we were pretty stuck. The electric company kept saying it would be back on “soon”, so you don’t really want to move out or head to a hotel if it will be back on in an hour, you know? So, we waited and we piled on clothes and blankets. Be sure to store your emergency kit in a waterproof container. (Remember to check your kit semi-annually. Make sure everyone in your family knows where the kit is kept. Be sure and store your severe weather emergency kit in the protected area where you plan to seek shelter from storms! Review your emergency plan with your family and post the written plan. Common Sense Note: Candles and matches in your kit might be great for use during a simple storm-related power outage blackout, but their use could be hazardous where actual storm damage to your apartment/house has caused gas leaks. Use with care! If possible, take your cell PHONE with you when you seek refuge! I would add blankets, or this 4 pack of Emergency Mylar Blankets, portable phone chargers, and because I was SOOOO very bored – a deck of cards, make sure you have plenty of games loaded on your tablet that don’t have to be played online . I’d recommend cash in addition to credit cards. If there is widespread power outages the ZON machines don’t work. Also, making sure you are never below half a tank of gas in your car, because gas pumps don’t work without power either. Great advice! We didn’t experience that, but, very good advice! I’d add paper plates, cups and plastic utensils. Also, people like us who have a well & septic system instead of city water & sewer may lose both running water and a way to flush the toilet. When a sever storm is predicted we fill and keep several 5 gallon containers of water in the bath tub. Great tips! Thanks for sharing! I will definitely add it! I would also add masks. In 2011 my family and I went through the Joplin MO EF5 tornado and face mask were great. Thanks, I hadn’t thought of that! Glad y’all made it through ok! Hi, all of these are good tips. I like to look at these tips and see if I should add more to mine. I would like to add that I live in the mid-west. Severe weather like ice storms, blizzards, wind storms and severe lightning happen every year. We have gone 10 days once with no power. I also keep a bag in my car. It has change of clothes, toiletries, 3 day supply of meds with med sheet, snacks, extra shoes (in summer I am in flip flops) extra portable battery fully charged for my cell, flashlite, ins papers and also copy’s of IDs. There have been times when power was out, trees down, roads blocked or severe snow/ice storm and I had to spend nite at friends as I could not get home. I also carry small shovel, cat litter, extra gloves, boots, heavy coat and blanket in winter. I also go through and change or update meds, snacks and water. The hardest thing to carry keep in car in winter is water as it freezes. Great tips! I would hate to ever be in that position, but, you never know! You would be prepared though! Great advice! I really want to get a generator. These are all really great tips and everyone should make sure their family and home is ready when disaster strikes. Being in the generator business, we highly recommend a house generator. You can rely on having power whenever your area has an outage which is the best way to be prepared.